230 pages | 39 B/W Illus. Ecobehavioral Consultation in Schools is a practical, theory-based text that advances the practice of ecobehavioral consultation (EBC) and teaches consultants how to develop their own successful practice. It includes examples of what the consultant could say at each step of the process, over 30 easy-to-use forms, and more than 60 interventions available for download on the book’s website. In addition, the explication of EBC theory helps the reader to better understand the "big picture" of each problem, going well beyond a strict behavioral approach to understand family, social, cultural, historical, and internal influences. Ecobehavioral Consultation in Schools isthe perfect companion for students in consultation-training programs such as special education, school psychology, school counseling, school social work, or for any other school professional interested in working collaboratively with teachers and parents. "Ecobehavioral Consultation in Schools is a masterful treatment of best-practice approaches for school-based consultants. It blends a strong theoretical orientation with outstanding coverage of research and offers practical ideas for professional practice. It’s a wonderful resource for anyone hoping to serve our schools as an effective consultant." "Ecobehavioral Consultation in Schools is the next must-have school-consultation resource. In it, Lee and Niileksela provide a solid foundation for scientist-practitioners who provide consultation services in schools. Grounded in ecological-behavioral theory and oriented toward application, it integrates research-based principles with highly useful tools and procedures. This text is a wonderful resource for students, trainers, and practitioners who need a highly practical guide for their work in schools." 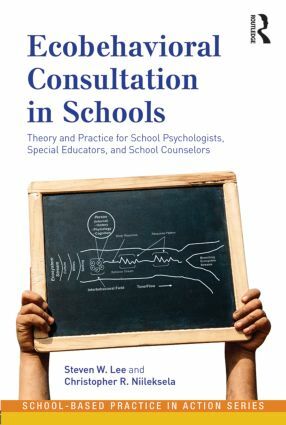 "Lee and Niileksela do a unique and masterful service to the field of school-based consultation by their comprehensive coverage of consultation and particular translation of ecobehavioral consultation. Their step-by-step cases, supporting forms, and data-gathering strategies place the use of this approach, long called for by leaders in the field, within the reach of motivated practitioners. Bravo on the long-awaited operationalization of this sophisticated approach to supporting change at multiple levels for youngsters, teachers, parents, and educational organizations!" Steven W. Lee, PhD, is professor and chair of the department of psychology and research in education and the former program director of the School Psychology Program at the University of Kansas. Christopher R. Niileksela, PhD, is a lecturer in the department of psychology and research in education at the University of Kansas.